WASHINGTON (CNN) -- Afghan President Hamid Karzai expressed skepticism Sunday that a pact signed between his Pakistani counterpart and tribal elders across the border will reduce the incidents of terrorism in his country. Attacks have actually increased along the border region of North Waziristan since the pact was signed, he told CNN's "Late Edition with Wolf Blitzer." 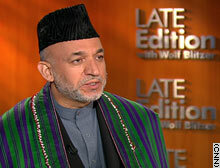 Karzai cited the recent assassination of the governor of the area by a suicide bomber. Karzai said he initially thought that Gen. Pervez Musharraf had signed the deal with the Taliban, who provided safe haven to al Qaeda during the Taliban's rule in Afghanistan. Musharraf told reporters last week that he cut the deal not with the Taliban, but with tribal elders, members of the loya jirga that oversees the region, and that he expected the agreement would reduce the incidence of terrorism in the area. Musharraf and Karzai are to meet Wednesday at the White House, where they are to dine with President Bush. "We will be meeting, the three of us, to find better ways of defeating terrorism," he said. Karzai said he was not worried that the world is losing its stomach for fighting, and expressed confidence that the effort would continue until it succeeds in eradicating terrorism from his country. "They will stay with us because this is not only a fight for Afghanistan," he said. Asked whether the U.S.-led war in Iraq was a mistake, one that fractured world unity over the issue in the wake of the September 11, 2001, terrorist attacks, Karzai did not answer the question directly. "The world may have a difference of opinion over Iraq, but the world is united in Afghanistan," he said. Still, he acknowledged, "Does Afghanistan need more resources? Yes." Afghan President Hamid Karzai told CNN attacks have increased along the border since the pact was signed.